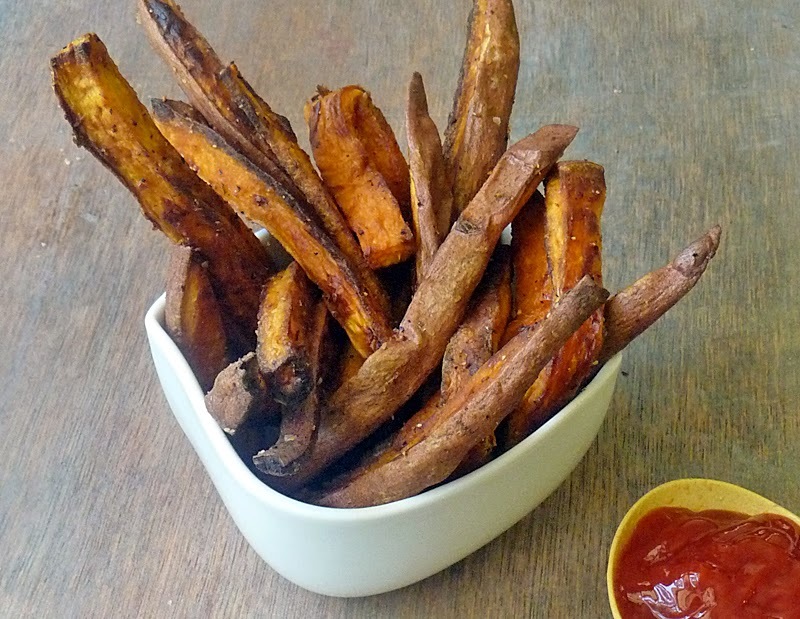 Healthy Baked Sweet Potato Fries are good for you! YES! You can eat french fries! And they taste so good, they'll likely become your go-to french fry. They certainly have in our house! Did you know that the sweet potato is one of the 10 most healthiest foods? It's true! This beautiful orange potato is good for you and it tastes great! It's a win-win! When my daughter was teeny tiny she used to eat sweet potatoes like there was no tomorrow! I would cut them into bite sized cubes and boil them until soft. She would snack on them all the time! I never left home without 'em! At one point, she had apparently been eating too many sweet potatoes and carrots that her toes turned orange! Freaked me out!! I took her to the doctor! I was terrified I had ruined her, and she would have orange toes forever! Thank goodness it was only temporary! Now she is all grown up, beautiful, smart, funny, and not orange at all! So feed this amazing super food to your little ones often, just not too often <wink>. Preheat oven to 425 degrees F. Line a baking sheet with foil. Reynolds Wrap non-stick foil works great! If you are using regular foil be sure to spray it well with cooking spray. 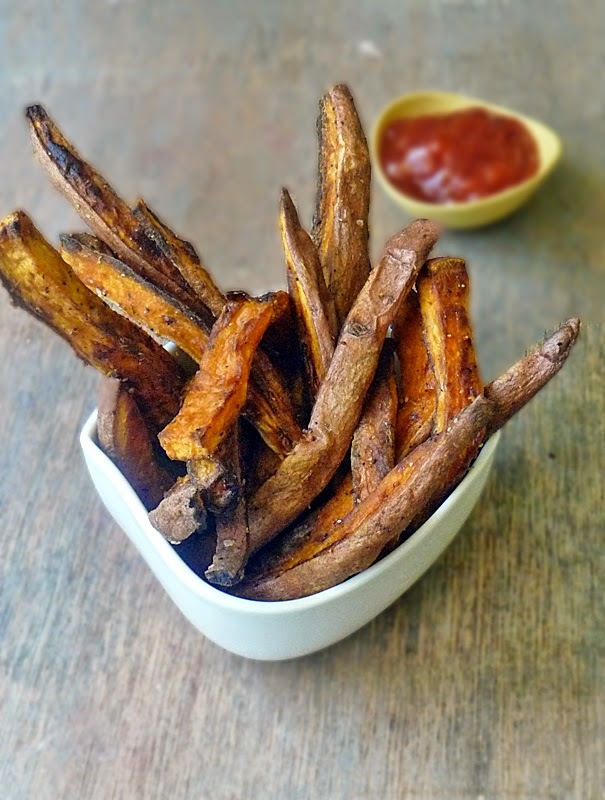 Place sweet potato wedges in a bowl and add 1 tablespoon olive oil (more or less as needed to coat the fries), 1-2 teaspoons salt to taste, 1/2 - 1 teaspoon fresh black pepper to taste, and 1-2 teaspoons garlic powder to taste. Because sweet potatoes vary in size, the amount of seasoning you use will vary. Use more or less as needed. The more you make this recipe the easier it will be to 'guess' what is right for you. Toss the potatoes to coat them evenly with oil and seasonings and place them on the prepared baking sheet. Be sure the sweet potato wedges are in one layer and there is space around each wedge. Leaving space around each potato wedge is important for getting them a little crispy. If they are crowded they will steam and be soggy. 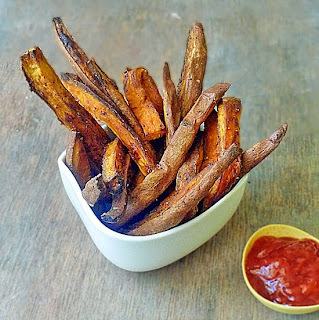 Bake the sweet potato fries for about 15 minutes and then turn each fry over and bake another 10-15 minutes. Watch them carefully so they don't burn. Keep in mind the cook time will vary depending on the size of your fries. If they are thick like steak fries you will need to cook them longer. If they are thin you will want to shorten the cook time. Follow Life Tastes Good's board Life Tastes Good: Sides on Pinterest. Do you peel the spuds first? What is the serving size and nutritional information on this? Bear, Serving size is about 1/2 of a medium sweet potato per person. With the olive oil, this will have approximately 100 calories per serving and about 5 grams of fat. Carbs are approximately 13 grams. All of this will vary depending on the size of your sweet potato. Turned out really good. I used parchment paper to keep the crispy. I'll be making these again. 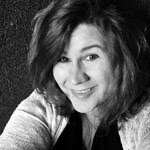 Thank you, Dalmon! I really appreciate you taking the time to let me know. Your comment made me smile :) Thanks for the parchment paper tip - that's good to know it worked for you! Never tried em unpeeled, but its worth a shot. will let you know how it is! I hope you love 'em as much as we do, Sean! Look forward to hearing what you think :) Thanks for stopping by! I had to laugh...when my middle child was a baby, he started turning yellow/orange. My dad, who was a firefighter, freaked out that he was becoming jaundiced. Took him to the Dr. and he had the same issue...his favorite foods: carrots, sweet potatoes, peaches, apricots. Son is 21 now, but this still comes up occasionally, glad it wasn't just me! Too funny! I'm so glad to know it wasn't just me too! Thanks for sharing! Happy New Year!! Apart from the aluminum,this recipe is terrific as is. Thanks. Aluminum goes into the brain and stay there, which is not a good thing. So the tin foil hat doesn't work? I use parchment paper sprayed with a little bit of canola oil whenever I bake.